DriveHQ Enterprise Cloud IT Features: True Drop Box Folder for receiving files. Anybody can upload files to you. DriveHQ's True Drop Box feature works like a mail drop box in a post office, allowing anybody to quickly and easily upload files to you securely. Once a Drop Box folder is created, simply share/publish the folder's Drop Box URL. Anybody can visit the URL and upload files into the folder without the hassle of creating an account. The Drop Box Folder feature is designed for you to receive files from anybody, incl. potential clients, unknown users, one-time users, or too many users that you cannot enter all their email addresses. The primary function of our drop box feature is to allow non-DriveHQ members to upload files to your private folders without having to log on. 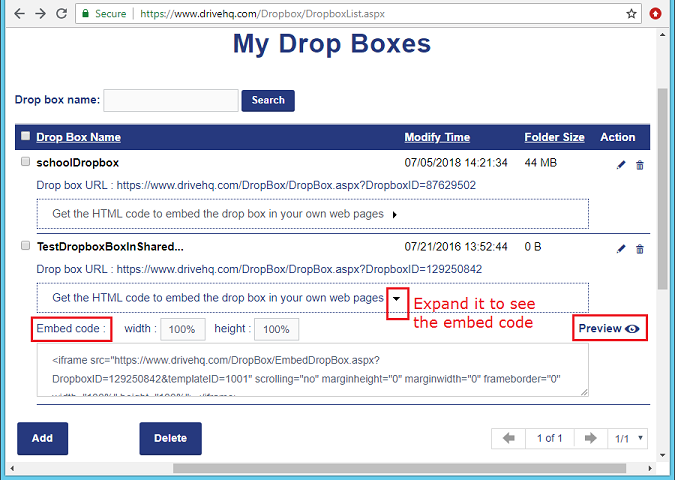 Embed the Drop Box Folder in your own website so that you can receive files from your users directly from your own web pages. Users cannot see data that has been uploaded to the Drop Box folder by others. You (the Drop Box owner) have full access to the folder; you can also create a password for a Drop Box folder to filter spammers. There is no limit to the number of folders you can turn into a Drop Box in your account. Create a synchronization task in DriveHQ FileManager to sync your Drop Box folder. You can access files uploaded to the Drop Box folder from your local computer. Set expiration dates for drop box folders so that the folder is not accessible for longer than you want it to be. You can assign email addresses to receive notifications when files are uploaded to a Drop Box folder. In addition to receiving files via the Drop Box URL, you can also receive files via the Drop Box email address. First, create a folder and check the checkbox "This is a Drop Box folder". 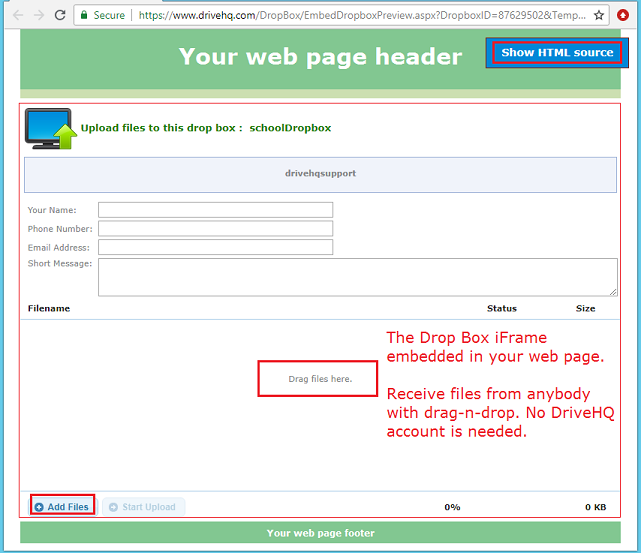 If you have already created a Drop Box Folder, you can simply log on to DriveHQ.com website, then from the DriveHQ Start Menu, click "Dropbox", you will see a list of Drop Box folders in your account.